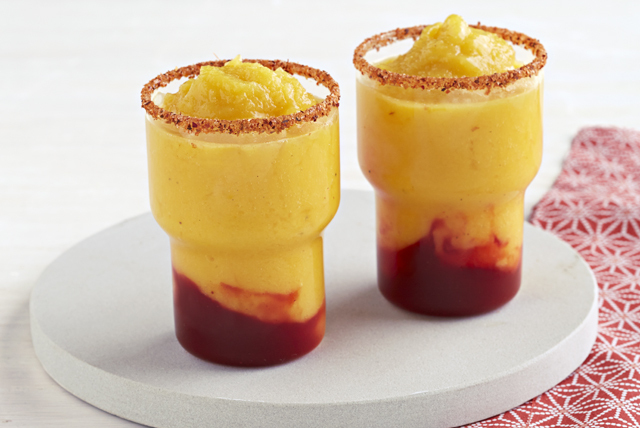 Blend chopped mangos, citrusy drink mix and ice to make these mangonadas! Icy Mangonadas for Two feature chamoy and are a Mexican-inspired must-try sipper! Spoon chamoy sauce into 2 glasses; top with mango mixture. Serve immediately. Similar to a hot sauce, chamoy sauce is a bottled sauce found in most Hispanic supermarkets. It's great served over fruit, potato chips or nuts. Made from mangos and chamoy sauce, mangonadas are spicy slushy drinks that come from the streets of Mexico. You can either drink them or eat them with a spoon - either way they are equally delicious. Look for frozen chopped mangos in the frozen food section of your supermarket. For a fun presentation, dip rims of empty serving glasses in additional chamoy sauce, then sprinkle with chili-lime seasoning. Fill glasses as directed. Serve with tamarind candy-wrapped straws.